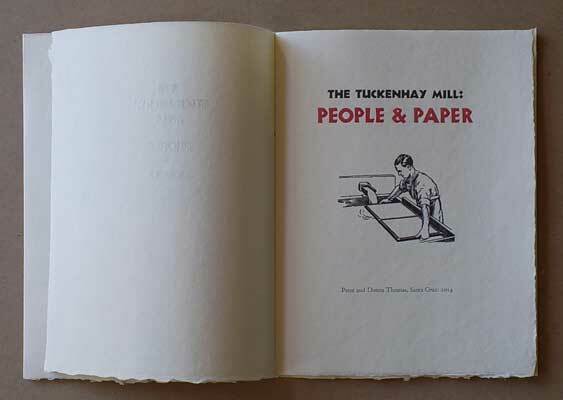 The Tuckenhay Mill: People and Paper (2016) Peter Thomas. 13 by 9 7/8 by 2 3/8 inches. 30 copies. 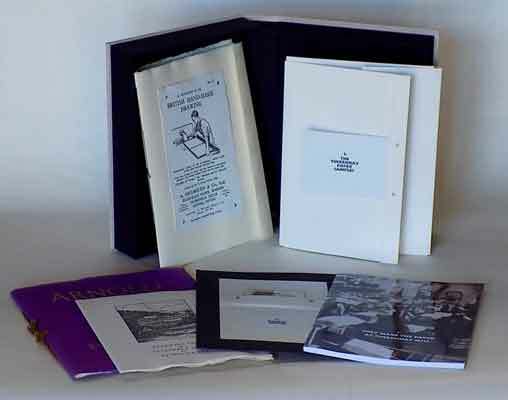 All items are housed in a cloth covered clamshell box. 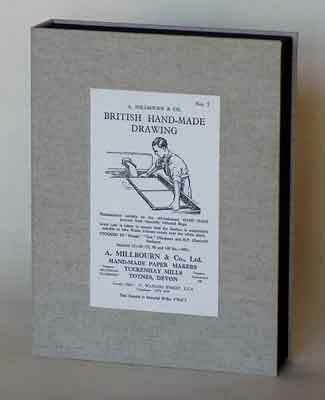 The label on the front cover was an actual sales pamphlet, printed for the mill, on mill made paper. Copy 1-10 have all 22 samples and both additional booklets. $1695. Copy 11-15 have 21 samples and both additional booklets. $1450. Copy 16 has 21 samples and one additional booklet. $1150. Copy 17-20 have 18 samples and one additional booklet. $1150. Copy 21-28 have 18 samples. $970. Copy 29-30 have 17 samples. $970. 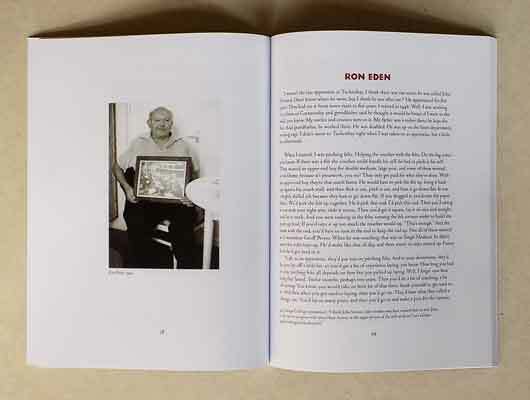 Each copy has an eight-page introductory booklet, letterpress printed on Peter’s handmade paper, with an index to the collection. It also has three examples of paper Peter made on moulds from the Tuckenhay mill. Each copy has digitally printed 100-page book with an explanation of the project, how it came to be, and edited version of the interviews. 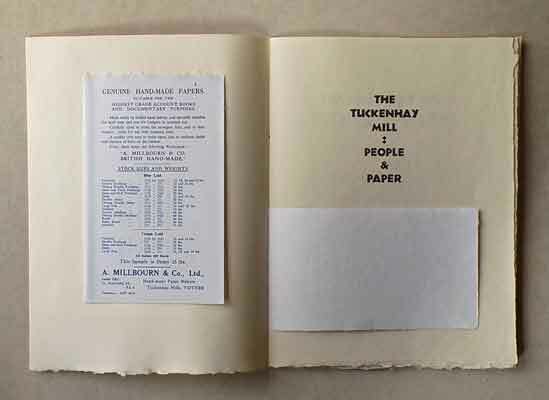 It is titled: They Made the Paper in Tuckenhay Mill – interviews with retired hand papermakers. 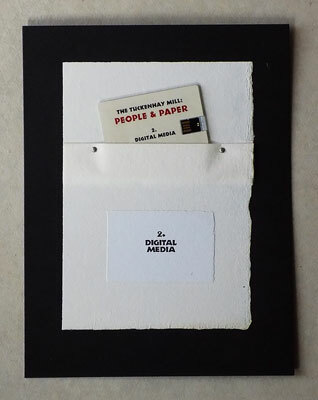 Each copy has a flash drive with the original interview recordings as .mp4 files, their transcriptions in both .doc and .pdf, and a video recording of one of the interviewees making paper at the Wookey Hole mill in Somerset, England. 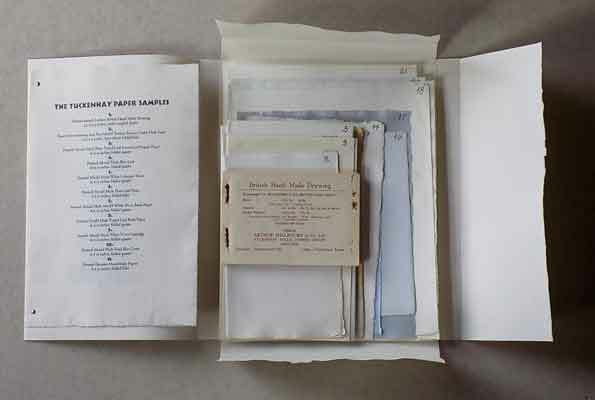 Each copy has a folder, made from Tuckenhay’s Lexpar paper, with 18-22 examples of handmade paper and printed ephemera from the Tuckenhay Mill. Copy number 1-15 have a 44-page booklet titled Three Hundred Years of Paper Making. Specimens Printed on Various Papers Made at Eynsford. 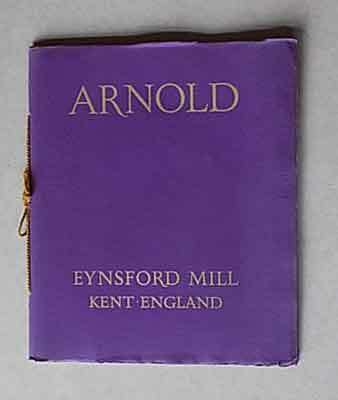 That was printed in 1948 at The Curwen Press, London with 14 tipped in samples on Eynsford paper. 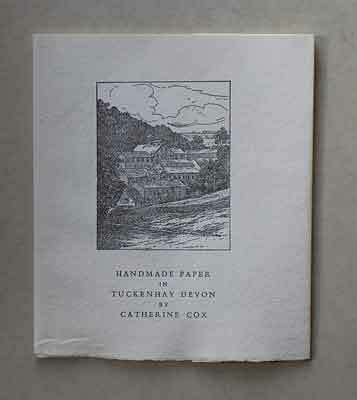 Copy numbers 1-21 have a 12-page booklet by Kitty Cox titled Handmade Paper in Tuckenhay Devon that was printed in 1977 by C.E. Mc Nally, Totnes, on Sheepstor Handmade Paper. 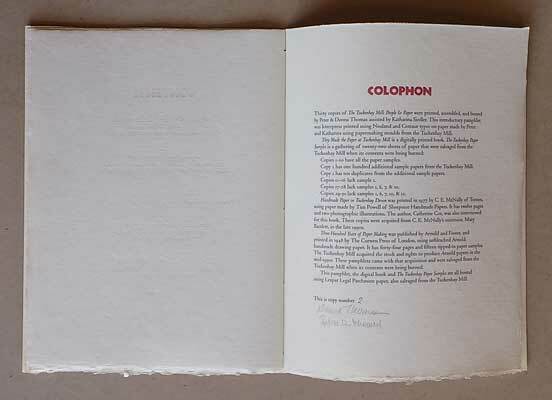 As a self-taught hand papermaker in the 1980s I wanted to know how apprentice-trained hand papermakers had made paper, to learn the exact motions the vatman used when dipping the mould thru the water. This desire circuitously led me to Tuckenhay where, in 1988, I met Cyril Finn, who had apprenticed and then worked as a hand papermaker at the Tuckenhay paper mill. I recorded him, his wife Joyce, and his half-sister Kitty Cox, as they reminisced about their lives working in the mill. They introduced me to other retired papermakers from the Tuckenhay Mill, and in 1988, 1990, and 1994 Donna and I returned to England and recorded their stories too. At this same time I acquired a few papermaking moulds, some mill record books and paper ephemera, from them, things that should have been burned in 1970. Perhaps fearing reprisal, all these papermakers we interviewed made us promise not to publish anything until the mill owner had died. In 2007, Kitty’s grandson, Steve Cox, contacted us while building a historical website for the mill and we considered reviving the project. However, we found the mill’s owner was still alive, and so had to let the tapes continue to gather dust. In 2013, talking with a graduate student at the University of Iowa about meeting and recording interviews with the retired papermakers in England, we were reminded that the interviews were valuable primary source material in a field where few historians had worked, and we were again encouraged to publish the interviews. This time, after some serious detective work, we found the mill’s owner had passed away and we were free to proceed. I was lucky to get these stories. I didn’t mean to. My initial goal was only to learn how to improve my own papermaking. I just wanted to watch Cyril work and that way learn how to properly perform the vatman’s shake. But hearing the things these retired papermakers knew about hand papermaking, I wanted to know more. I was not trained as an investigative reporter and did not know how to conduct an interview properly. I did not always speak slowly and clearly. When I became interested in another line of questioning, I would cut off their responses in mid-sentence. Sometimes there were two or three people talking at the same time. The results, when transcribed, were choppy and hard to follow. To resolve these problems we decided to remove my voice and turn the interviews into first person stories. First we sorted the transcriptions by speaker, then by the subject being discussed. We then rewrote the information, integrating my questions into the replies, merging what was duplicated, and editing what was left to create a first person story for each of the 8 people we interviewed. 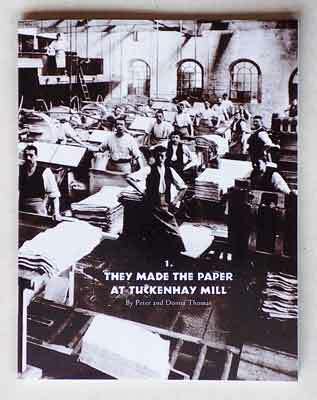 The text of They Made the Paper at Tuckenhay Mill first gives a short history of the mill, then tells my story of meeting Cyril and recording the interviews, and finally presents edited versions of the papermakers’ stories from the interviews. A flash drive with the original audio recordings and complete transcriptions is included to give a voice to the papermakers, and allow the scholar to hear and read exactly what the papermakers said. A video recording of Cyril making paper at Wookey Hole is also there, to help the reader form a better picture of the equipment and process the papermakers are talking about in the interviews. 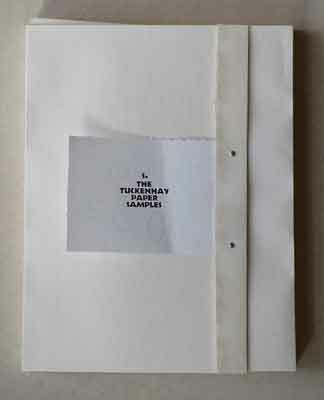 Finally there is the paper in the Tuckenhay Paper Samples folder. It will give the reader another way, a very tactile way, to understand the raw material of the stories told in the interviews: handmade paper.